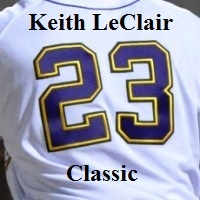 Junior righthander Ryan Williams parceled out six hits over seven innings with five srikeouts to pave the way for East Carolina's 2-1 victory over Boston College Friday night in the Keith LeClair Classic at Clark-LeClair Stadium. Williams, a transfer from West Valley (CA) College, worked efficiently and kept the Eagles bottled up except for an unearned run on a sixth inning throwing error by junior shortstop Jack Reinheimer. East Carolina pushed a run across in the third on an RBI single by junior first baseman Chase McDonald and added what turned out to be the decisive score in the fourth on an RBI double by senior rightfielder/third baseman Jay Cannon. Williams (1-1) got credit for the victory, while Eagles starter Eric Stevens (0-2) took the loss. Stevens surrendered six hits and four walks and hit a batter in 6 2/3 innings. Designated hitter Drew Reynolds assumed the ECU pitching chores with one out in the eighth after reliever Jake Harris surrendered back-to-back singles. Reynolds, a junior righthander, walked the first batter he faced to load the bases before retiring the next five hitters to clinch the outcome and pick up his first save of the season. Including Thursday's 8-2 win over Illinois in the KLC opener, the Pirates are 2-0 in the annual event, followed by New Mexico State at 1-0, Illinois at 1-1, Boston College at 0-1 and Ohio at 0-2. In Friday's earlier games, Illinois defeated Ohio 11-6 and New Mexico State blanked the Bobcats 7-0. Today's rain-altered schedule pits the Illini against NMSU at 3 p.m. and Ohio against Boston College at 7 p.m. The tentative Sunday slate pairs Illinois against BC at 9 a.m. and ECU against the Aggies at 1 p.m.
Records: ECU 2-3; BC 1-3. DP - BC 1; ECU 2. LOB - BC 8; ECU 6. 2B - Bourdon, T 2(2); Cannon(1). SH - Reinheimer(1); Watkins, T.(1). Win - Williams, R. (1-0). Loss - Stevens, E (0-2). HBP - by Stevens, E (Thompson, N.). Umpires - HP: John Haggerty; 1B: Steve Sanders; 3B: Gary Swanson. Start: 6:00 PM; Time: 2:31. Page updated: 02/23/2013 09:57 AM.